Investing in a good-quality saddle helps ensure your and your horse's comfort and safety. Whether you purchase a new saddle or a used one, ask if you can take it for a test ride or at least sit in the saddle while it's on a fence rail or saddle rack so you can see if it is comfortable. Take a tape measure and double-check seat size when shopping for a saddle. English saddles are measured in inches across the seat from the back of the cantle to the pommel. English saddles can be in whole or half sizes. Western saddles are measured from the back of the cantle to the horn or the hole just in front of the horn. Western saddles are always listed in whole inches or whole sizes. A new saddle shouldn't have a problem with its tree, but an older saddle can have a cracked or broken tree, rendering the saddle useless. A broken tree can pinch or hurt a horse's back. To check the tree on a used saddle, run your hand down the back of it. Hold the saddle up and check the shape. Does it maintain its shape when you turn it over and around in your hands? Next, pull each part of the saddle including the pommel, cantle and panels. If they are loose or they squeak, pass on this used saddle, as the tree might be damaged. Examine the entire saddle from top to bottom. New saddle leather should be of uniform color. Used saddles may show some signs of wear, especially on the seat or leg panels, but avoid saddles that show excessive stains, cracks or rubs. On used English saddles, check the panels on the leg flaps. Panels and blocks are stuffed with foam, felt and wool, or a combination of these materials, and they can break down over time. You can replace them, but you may want to bargain down the price of the used saddle if they show excessive wear. Stitches and buckles on both new and used saddles should be firmly affixed to the saddle. Make sure that all the buckles are in place and that they work. Run your hands over the saddle and inspect the stitching. Look for loose stitches or skipped stitches. Both may be signs of an inferior saddle. 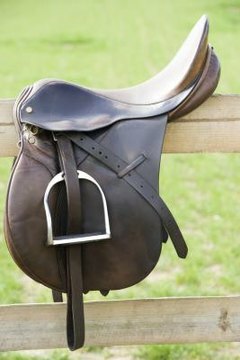 On used saddles in particular it's critical to check the girth or cinch buckles, as these frequently wear out and can be a safety hazard.